Don't get me wrong, I love my job but sometimes it feels like I am introducing the people I talk with to technology for the first time. After 8+ hours it can start to wear on you. Because of some financial "situations" that are beyond our control, I am working as much overtime as possible and I miss having that time to do things with family and for myself. I need that time to remember what I am working for. 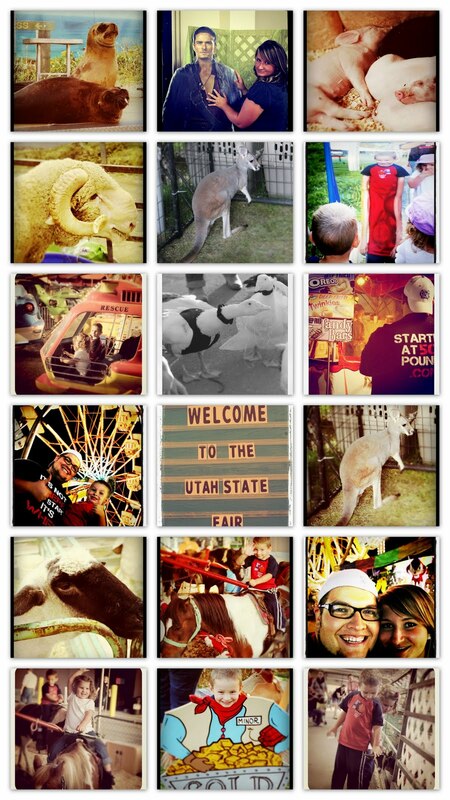 Every year, it has become family tradition to go to the Utah State Fair. I was quickly reminded of every food temptation imaginable. For some reason there is an unspoken goal between the majority of vendors to find the most unhealthy food imaginable and put it on a stick. Looking at it from different eyes, it was strange to think how the goal was to go and try to consume as much of this type of food as possible. I told my wife when we were at the fair, "If the main attraction of the fair is unhealthy food that we can't eat it's more like an unfair." I'm not going to lie. There were several times I wanted to yank the pizza & ice cream we had gotten for the kids out of their little hands and go Cookie Monster on 'em but I didn't let the thought of consuming food consume me. My favorite parts were watching how happy and proud Jeffrey was riding "The BIG wheel" and seeing Katie in her element on her pony. I saw a good friend I hadn't seen in probably 10 years and it felt great not to be embarrassed about my weight. Life isn't about food. Living it up doesn't have to mean eating it up. We had a great time and our kids will remember all the fun we had long after the memories about the food they ate fade away. Well, it looks like you guys had fun! I have a hard time going to festivals and fairs because I wan to pig out on the jumk food! Way to resist! Yes, it is not the food, it is the event! We have a great state fair here in MN, too. This year was my second time going since I started this journey to get fit. I stayed away from everything but one corn dog. And I factored that corn dogs calories into my daily budget. Win, win at the state fairs! I have been wanting to go to the Texas State Fair for years and I never had the opportunity.The main reason I had wanted to go in the past was for all the junk food. I am planning to go this year and the food is kinda scary for me. I know that if I go I am gonna want to try a few things...maybe more than a few. So I am kinda still on the fence of whether or not I should go. We shall see. Pack snacks and eat a meal before you go. If you are dying to try something set your limit before you go. Sounds like everyone is digging their StateFair as much as we do. I think someone could make a killing having a healthy but delicious treat option. I think vendors at the fair should have to post calorie menus. That would help me out a ton. Although, I guess if you are jumping into a deep fried Snickers Bar you are throwing nutritional info to the wind anyway. Kar and I shared a vanilla berry soft serve and had a piece of grilled chicken each.